I always need big bags as my everyday bags because I carry a lot of things with me. This is one of my bags which is from Accessorize and I've been using it for two years. 4. Hand gel - you know you need your hands to be less smelly. It is proven that hand gel does not efficiently decontaminate your hands so I don't use it much if there's soap around. 7. Wallet - bought it from Accessorize as well. Inside: cash, cards and some personal information. By the way, I'm looking for a smaller wallet because this one takes too much space. Sometimes I carry my laptop with me if needed. Oh! And a lunchbox too! 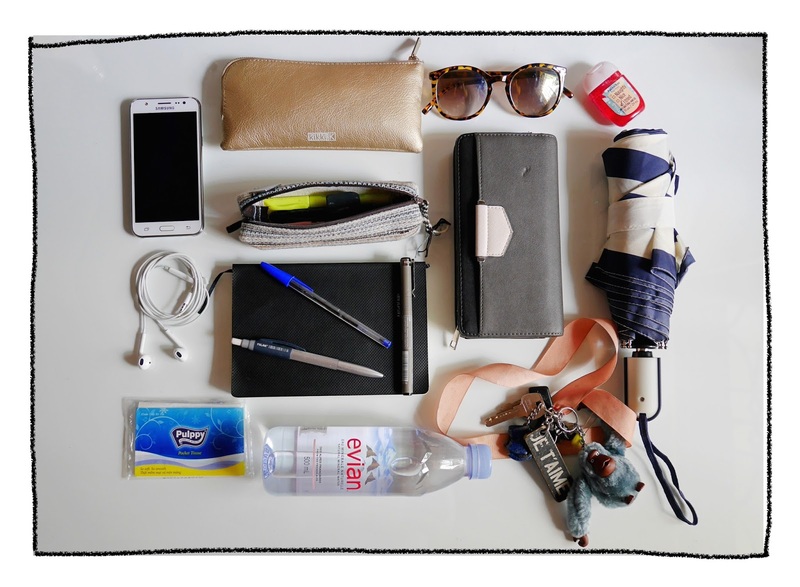 What's in my gadget pouch? P/s: Please note that I have embedded all the links that I possibly found in the mentioned products. 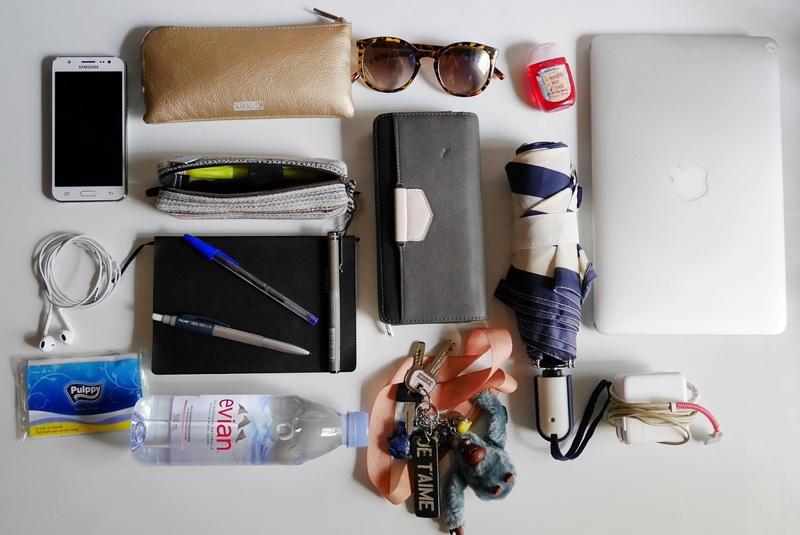 All the essentials in your bag! That's perfect! the purse is too big for my bag. i only keep cash and my credit cards in there. I love your bag! Also, super cute umbrella, you should see mine - it's so ugly lol! 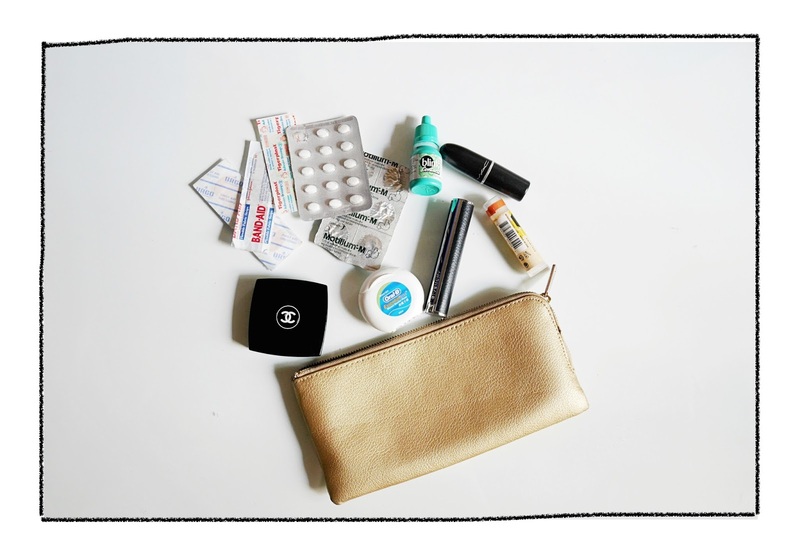 I love your essentials <3 especially your make-up! Very nice bag contents! so neat! Loving the color palette of your outfit!! So on point! Lovely post! Love the flatlays! Such a cute bag! I always have a mini notebook in my bag as well! This is good that you can manage to bring a water bottle with you. My bags are usually pretty small ! very nice bag contents! and everything's so neat! I love how you shot and edit these photos! Some great stuff, I love the simplicity of those sunglasses. Thank you for this selection ! Love it ! That bag is a perfect bag for everyday looks! Love the little gadget/ healthcare kit, you are super prepared! I love your blog! So creative.